Some great hotel in England for Christmas! ExProducter on the run roving Europe for those special hotels and restaurants. Actress and now travel writing with her husband David for Gourmet Voyageurs and "The Toulican". 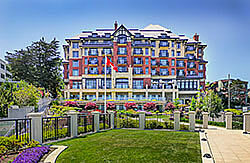 A Luxury Resort on the outer edges of Victoria on Vancouver Island, BC Canada. Built in an English Manor House style and reopened in the fall of 2012, Victoria’s Oak Bay Beach Hotel has been completely reconstructed to an international luxury standard on the same spectacular oceanfront lot where the previous hotel sat for more than 85 years. Legendary and iconic, the Oak Bay Beach Hotel, on the edge of Victoria on the lovely Vancouver Island, is a complete destination by itself as it sits right on the shore extending out into the sea. The staff are extremely gracious and attentive and ready to assist at every turn. A delightful small, intimate restaurant with modern cuisine that drips with the products Provence served either in the Victorian "conservatory" glass and girder dining room or in the shade of the ancient olive trees on the terrace outside. One of our favorite eateries in France. With the arrival of Chef Philippe Colinet in 2014, the cuisine has reached new highs of skill and professionalism. The dishes are at once simple and complex. This experienced chef brings to the kitchens of l'Olivier a deft touch and creates both a visual appeal and feast for the senses. The hotel La Bastide de Saint-Tropez***** has been one of our favorite relaxing and private places to let down and relax for many years now under the capable and delightful hand of Director M. Fabien Delaffon. 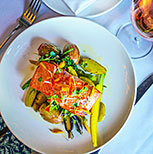 The Cypress Inn*****, Lincoln & 7th., Carmel-by-the-Sea, California 93921 USA. The Cypress Inn is one of those lovely establishments with one foot in the relaxing ambiance of the past and one foot tentatively reaching toward the present. There is an old world charm about this historic hotel that leads you toward letting down and taking a nap in one of the deep sofas or arm chairs in the high ceilinged, wooden beamed lounge with a book on your lap in front of the blazing fire. Sometime between 1:30 and 3:45 you may be gently awakened by a young lady bearing a silver tray of English tea and goodies, a flower in a small silver vase. Recipe: Executive Chef Jean Paul Lair of Restaurant "Le Vallauris" in Palm Springs, demonstrates the first of three videos how to prepare his "Maine Lobster Soufflé. Take a tour of Château Hotel de la Messardière ***** (see left) and listen to the informative introduction by General Manager Alexandre Durand-Viel. Visit the spa of La Messardière with its own indoor swimming pool, gym, steam room, and extentensive treatment rooms not to mention its own garden with fountains to sun and relax. All rights reserved peter d'aprix ©1985-2018.